Kerala is referred in historical terms as Keralam, is a state in the South-West region of India on the Malabar coast. It is a place where you get to see Lush green fields, flowing rivers facilitating fertility of land, white sandy beaches with blue waters kissing the sand, backwaters and houseboats that sail on them. The culture of Kerala is a synthesis of Aryan and Dravidian culture. 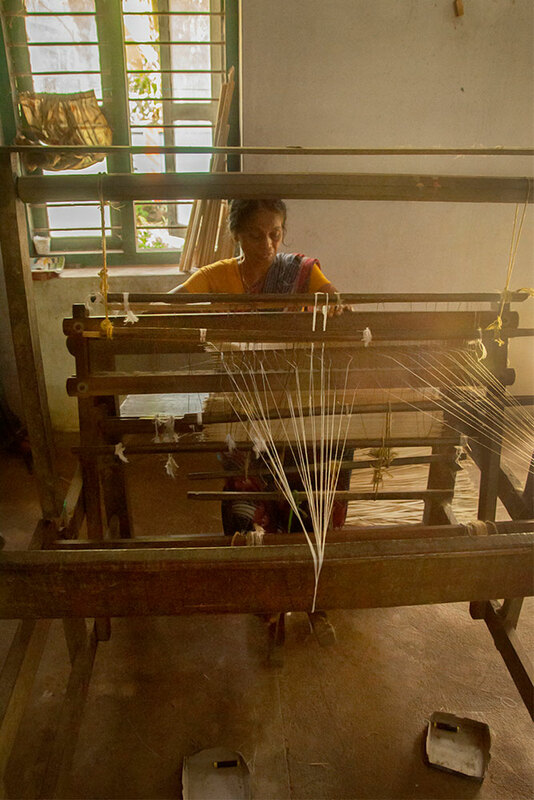 The famous Mat weaving, Bamboo Mat painting, basket making, wooden furniture making, pottery, leather works, handloom, are the important handicrafts of Thrisuur which is known as Trichur, is a city in the Kerala state of India. This place is a revenue district of Kerala. The district is famous for its ancient temples, churches, and mosques. Irinjalakuda is a town in Thrissur district, the name Thrissur is derived from 'Thiru-Shiva-Perur' which means "The city with the name of the Lord Siva". Thrissur was also known as "Vrishabhadripuram", with its rich history, cultural heritage & archaeological wealth, is called as cultural capital of kerala. 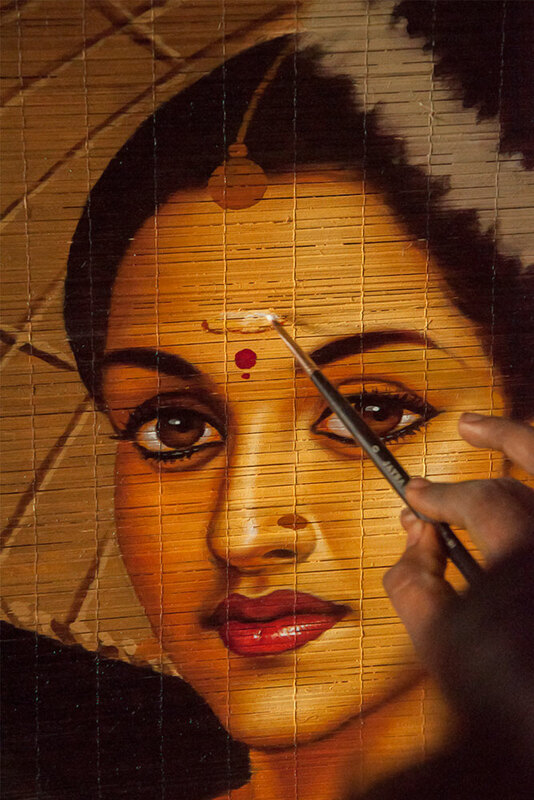 Irinjalakuda is well known for its bamboo mat painting work. For the lover of Art and Crafts, Kerala is truly heaven. Its centuries old crafts have enthralled millions of visitors till date. The most prominent among the arts and crafts of this scenic land are Painting and Handicraft. • Paintings: The beautiful paintings of Raja Ravi Verma. • Handicrafts: Handicrafts in Kerala range from exquisitely woven silk sarees to brass and metal works to wall hangings, coconut shell products to gold and silver jewellery. • Brass and Metal works: Bell metal, which is an alloy of tin, copper and brass, is moulded into several shapes and sizes to create figures that depict mythological events. • Coir and Cane Products: The cottage industry of Kerala boasts of manufacturing of coir products. • Sandalwood Carving: The districts of Cochin, Trichur, Tiruvananthapuram and Ernakulam are particularly famous for articles made of sandalwood, which is fragrant wood. • Kerala Sarees: Kanchipuram silk sarees from the state of Kerala have not only found patronage in our country but have also gained popularity abroad. Bamboo is a group of Woody perennial grasses in the true grass family poaceae,which is a large family with over 10,000 species. There are many different opinions on how many species of bamboo that there are. Some say there are approximately 1000 species of bamboo, while others say there are more than 1600 species. Twenty-two species of bamboo and two varieties belonging to six genera are recorded as native of Kerala. These include genera such as bambusa, Dendrocalamus, Pseudoxytenanthera, Schizostanchyum, Sinarundinaria and Ochlandra. Kerala has around 11 types of thin walled bamboos called reeds (Ochlandra genera), which are generally used mainly for weaving purposes by the traditional artisans. Bamboo mats woven from reeds are very popular in the state. 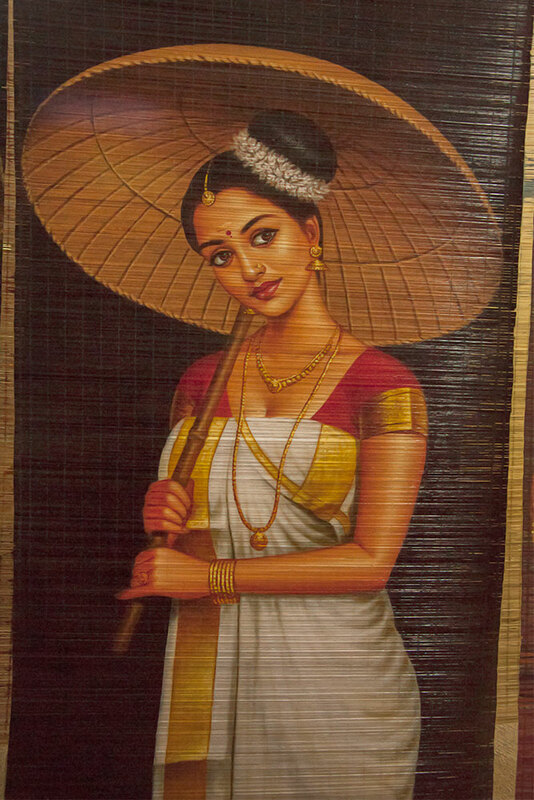 Irinjalakuda is very famous for its bamboo mat painting. Deepthi Handicrafts which is about 15 years old industry in Mapranam, Irinjalakuda is one of the industries who are specialized in mat weaving and mat painting. The bamboo culms which are required for making bamboo mats are imported from Thrissur. 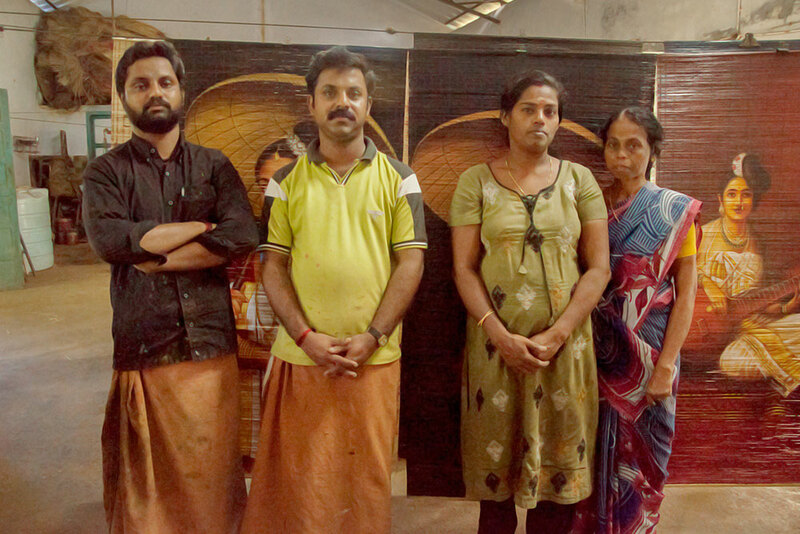 These bamboo paintings are exported to Ernakulam. 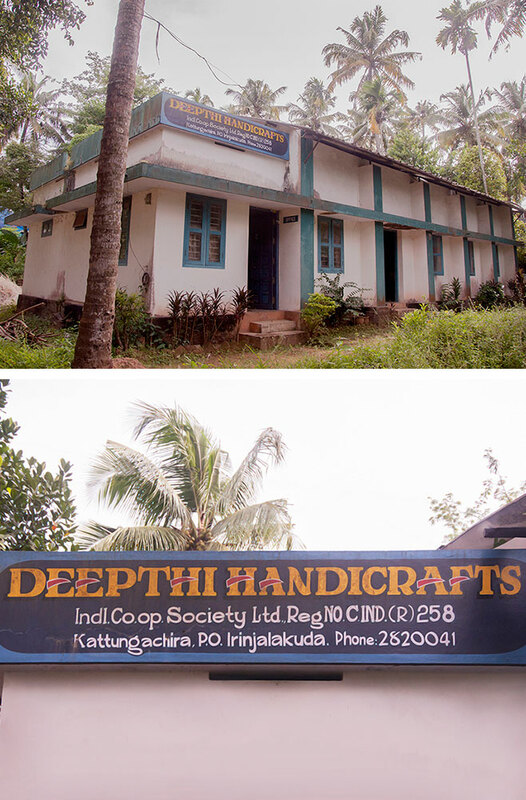 Deepthi handicrafts is about 15 years old industry with 6 staff working in the process of mat weaving and mat painting.